Yellowstone has always held a special place in my heart, with its beautiful meadows, soaring mountains and awe-inspiring geysers. Two very different non-fiction picture books introduce children to the wonders of Yellowstone. Yellowstone Moran: Painting the American West shows what it was like for early explorers to venture into this wilderness in the 1800s, and how Thomas Moran's paintings helped capture its beauty and persuade Congress to protect it. The Wolves Are Back shows children how reintroducing wolves restored nature's balance in the ecosystem of Yellowstone. Thomas Moran "had never ridden a horse, never shot a gun, and never slept in the open air," but he was determined to join Dr. Hayden's expedition to explore the land called the Yellowstone. "Few men had explored this high wilderness. Those who had been there told strange tales of mud volcanoes and spouting geysers at a place called Firehole Basin." The expedition was hard work, climbing steep mountain passes on horseback, fording rushing rivers, sometimes only covering a few miles a day. Readers will be astounded, along with Moran, at the sight of steaming hot springs, massive waterfalls, and the Grand Canyon of the Yellowstone. Moran's paintings helped to convince President Grant to designate Yellowstone as the first National Park in 1871. 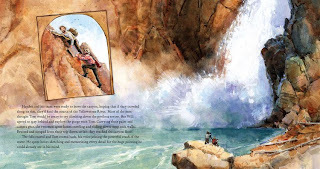 I particularly liked the author's note at the end which describes for young readers how she used the expedition members' journals to reconstruct the story. 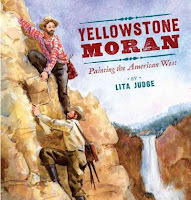 Judge has recreated Moran’s style in her dramatic watercolors, and her paintings (like Moran's) will make young readers want to venture to Yellowstone themselves. For another review of Yellowstone Moran, see The Miss Rumphius Effect. 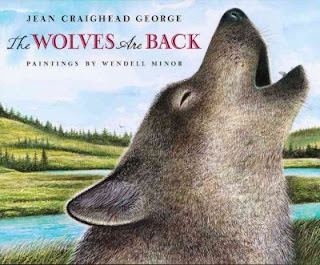 Jean Craighead George and Wendell Minor have captured the remarkable story of wolves being reintroduced to Yellowstone. Wolves were almost hunted into extinction by the early 1900s, but in 1995 a small number of wolves were brought from Canada to Yellowstone. As the wolf packs grow, the entire ecosystem starts to returns to its natural balance. In one example, the young wolf pup can now hear birds singing in the meadows because the wolfs are back. George explains the relationships quite simply. The wolves drove the elk herds higher in the hills. With the elk gone, the valley grasses grow taller. This allows for the return of the Vesper sparrow, which uses the grasses for food and nests. George tells this story with just a few lines on each page. Minor's paintings will also engage young readers, as they focus on the variety of animals in Yellowstone. Together, the words and pictures draw young readers into a deeper understanding of how ecosystems work, and fill them with an optimism that we can help nature find its balance. Share nonfiction stories with your children. Expand their world, introduce them to concepts, share places you'd like to visit one day. For more great ideas, visit Wild About Nature for Nonfiction Monday. Yellowstone Moran and The Wolves Are Back are available at your local library. You can also find them at your local bookstore or on Amazon. If you purchase a book from Amazon by clicking through this blog, a small percentage will go to Great Kid Books and will be used to buy more books to review. Thank you for your support. Each year, I find it so helpful to see the books honored by the Sydney Taylor Book Award, an annual award given by the Association of Jewish Libraries. In my mind, these books are of outstanding quality, are heart-felt and moving, and authentically portray the Jewish experience. I have just started to dig into the books that have received the award in 2010, but I wanted to share these titles with you. I will share with you my impressions on the books I have read. This story is full of love and warmth as it follows young Izzy as he says, "I'm sorry" to people he cares about. 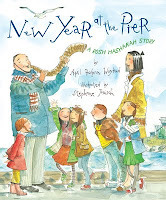 Izzy and his family are getting ready for the Jewish New Year ceremony of Tashlich, when people apologize for the mistakes they made the previous year and start the new year with a clean slate. But saying, "I'm sorry" is a hard thing to do. This story presents a child's view on how to make atonement by saying sorry from the heart and forgiving others for their wrong doings. With striking illustrations, this book shows what was so amazing about pitching great Sandy Koufax. Starting with his early years, Winter shows how Koufax learned to control his pitching, and developed to become one of the all-time greatest pitchers. 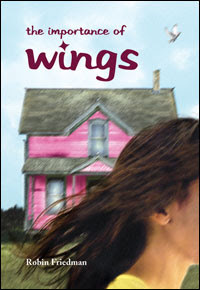 Although I haven't had a chance to read The Importance of Wings yet, it is a book I am very drawn to. I am fascinated by its cross-cultural explorations, as it follows a two young girls from different families who have both immigrated from Israel to the US in the 1980s. To be completely honest, I can remember my own futile attempts to have "wings" - and that memory captures my adolescent feelings of wanting to be "cool" and fit in with everyone else. For a wonderful review, head over to Becky's Book Reviews. This is a book I have ordered for my own 11 year old daughter. 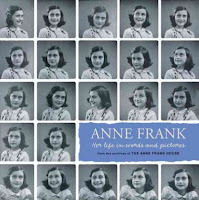 She is interested in the Jewish experience in World War II, and this seems like a sensitive but gripping introduction, similar to Number the Stars. From the publisher: "In 1939 Sweden, two Jewish sisters wait for their parents to join them in fleeing the Nazis in Austria, but while eight-year-old Nellie settles in quickly, twelve-year-old Stephie feels stranded at the end of the world, with a foster mother who is as cold and unforgiving as the island on which they live." Young Daniel escaped Nazi Germany with nothing but his dream that he might one day be reunited with his parents. But New York has turned away his ship full of refugees, and Daniel finds himself in Cuba. What enfolds is a touching story of friendship between Daniel, David, an older Jew who has lived in Cuba for many years, and Paloma, a young Cuban girl who is struggling with her relationship to her father. This novel in verse drew me into David and Paloma's world, although it wasn't as satisfying as some historical fiction. For a full review, see Betsy Bird's Fuse #8. 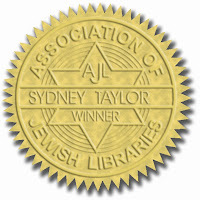 The Sydney Taylor Book Award is presented annually to outstanding books for children and teens that authentically portray the Jewish experience. Presented by the Association of Jewish Libraries (AJL) since 1968, the Award encourages the publication and widespread use of quality Judaic literature. Gold medals are presented in three categories: Younger Readers, Older Readers, and Teen Readers. Honor Books are awarded silver medals, and Notable Books are named in each category. Winter brings rain to California, lots of it this year. We know that it's a good thing - we certainly need to replenish our dwindling water supplies. But endless days of rain can dampen everyone's spirits. 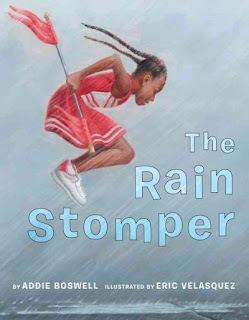 If you need cheering up, check out Rain Stomper, a book full of energy and optimism as one girl shows us that the parade will go on, rain or shine! But the story doesn't stop with the rain storm. Jazmin didn't let the storm get her down. She decided to go out anyway, stomping, jumping and kicking in the rain. Kids came out of their houses to watch Jazmin as she splashed, spun and jumped, and her energy and optimism drawing them into the parade. 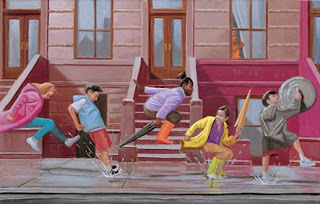 Velasquez's illustrations are dynamic as they show Jazmin's energy and all the kids as they all splashed, banged, bashed, and clattered on the sidewalk. To see more of the pictures, visit Velasquez's website. A wide range of kids will enjoy and appreciate this book. Young children will love the sounds of the book and want to go out and stomp in puddles themselves. Students in first through third grades may enjoy trying to put sounds in their poetry to add action and drama. Older students will be able to identify some of the poetic devices, especially the onomatopoeia such as "the wind whistled through her hair." I also love how this book shows a character working to solve her problems, taking action and doing something to turn a bad day into a great one. Get your rain boots on and don't let the storm clouds get you down. I'm sure there are some puddles you can stomp in together! The review copy came from my local public library. Find a copy at your local library using WorldCat.org or ask for it at your local bookstore. If you order through to Amazon using these links, a small commission will go to Great Kid Books. Thank you for your support. Did your parents tell you to stop playing with your food? Mine sure did. Well, I'm here to tell you, to beg you, "Play with your books!" The best story I heard all week came from a father who loves to play with his toddler son when they read stories. His son's favorite story is How Do Dinosaurs Say Goodnight?, but they don't just read this story together. This dad makes the toy dinosaur read the story, and the little guy just eats it up. "Dinosaur has to read tonight!" is the little boy's nightly request. So, here's a post about playing with your books. Make reading fun, laugh together, love books and spending happy time together. This story just begs to be played with. Enormous, playful dinosaurs demand the works as their parents try to put them to bed. How does a dinosaur act when Papa comes in to say it's bedtime? "Does he slam his tail and pout? Does he throw his teddy bear all about?" Young children can tell the whole story from Teague's expressive paintings, and that's part of the charm of why this works so well with preschoolers. They can take part in this book on their own terms, reading it in their own way. It also works so well because kids this age are just starting to play with humor. And they get the joke of how outlandish these "baby" dinosaurs are acting. HERE TO VISIT HUMAN RACE! Meno begins his day by finding his best friend, Yamagoo. Next comes breakfast, aka “sunshine snack,” with “moo juice” (milk) and “dough with hole” (doughnuts). Then it's time for a “Big Fun.” I'll keep it a surprise, but needless to say, big fun has all my children in giggles. Tony DiTerlizzi, best known for the Spiderwick Chronicles, created this series with his wife, Angela. It came from their love of Little Golden Books, old Fischer-Price toys, and vintage cereal boxes. But most of all, it was inspired by their "silly, sweet two year old daughter who delights in lots of imaginative read-alouds and bedtime stories" (http://planetmeno.com). You can go to the Planet Meno website to read the second book and get a sense of the art and story. 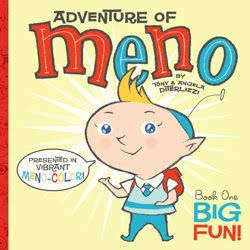 Best of all, the Adventures of Meno work great as both first books for toddlers and as early readers for kindergartners. Both groups love the simplicity, the mild potty humor (just a little tooting), and the simple vocabulary. And I love any book that has my children in giggles! The review copy of the Adventures of Meno was kindly sent by the publisher. How Do Dinosaurs Say Good Night? came from our home collection. You can find many of the How Do Dinosaurs... books at your local library using WorldCat. Big Fun! is in some local libraries, and can be found on WorldCat. These books can also be found at local bookstores and on Amazon. Please note, if you click through to Amazon using these links, a small commission goes toward Great Kid Books and will be used to buy more books to review. Everyone loves a contest - the competition is exciting, and a lot of buzz is created. This week, the American Library Association announced their award winners - for the Newbery Medal, the Caldecott Medal, and many others. Contests are great for highlighting wonderful books from a vast field. But in order to be meaningful, you need to know what books will appeal to your child. Instead of going through each award, I'd like to highlight some of the awards that will have appeal to different age groups, starting with the youngest first. The Lion and the Mouse, by Jerry Pinkney - this is a truly amazing, nearly wordless picture book that retells Aesop's fable where the mouse saves the lion from the hunter's trap. It mesmorized our kindergarten class - they were completely silent (!) as they watched the pictures unfold the story. This is the first time an individual African American has won the Caldecott Medal, and is well deserved by Pinkney. 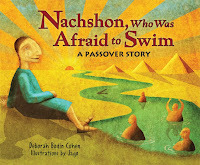 Winner of the 2010 Caldecott Medal. 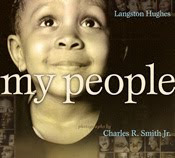 My People, by Langston Hughes, illustrated by Charles R. Smith, Jr. - this poem is gracefully simple as it celebrates the spirit and beauty of African-American people. Each page pairs a short phrase with a portrait of one or more African-Americans. Little children will be drawn in by these photographs full of emotion and life. 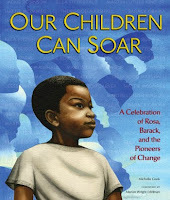 Winner of the 2010 Coretta Scott King Illustrator Award. 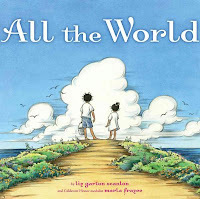 All the World, by Liz Scanlon, and illustrated by Marla Frazee - this is a delightful book as it transports readers all over a young person's world. I love the way it zooms into the small scenes of a young child's life, following a busy day with their family from the beach, to home, to a family gathering at night. The illustrations are radiant as they show the every day magic in the child's life. 2010 Caldecott Honor Book. I Spy Fly Guy! written and illustrated by Tedd Arnold - this series is very popular at our school, and this newest installment is very funny. When Fly Guy and Buzz play hide-and-seek, Fly Guy hides in his favorite place--the garbage can. But as Buzz finishes counting, the garbageman drives away with the garbage and Fly Guy, too! 2010 Geisel Honor Book for beginning readers. Where the Mountain Meets the Moon, by Grace Lin - This is a wonderful, magical tale - absolutely enchanting. I can't wait to read this aloud with my 3rd grader. Minli goes on a quest to find the Old Man in the Moon who can tell her the answer to her most pressing question - how to make her parents' life easier and better. It is a classic quest, but Chinese folk tales are woven throughout Minli's tale in a very unique way. This is a perfect book to read aloud with 2nd and 3rd graders. 2010 Newbery Honor Book. 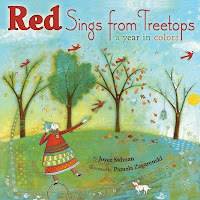 Red Sings from Treetops: A Year in Colors, written by Joyce Sidman, illustrated by Pamela Zagarenski - although the illustrations and topic will appeal to a wide range of children, I think these poems are perfect for children who are moving into reading and writing more fluently. Sidman's poetry is full of strong imagery and action. Describing a hummingbird in summer, she writes: "Red darts, jags, / hovers; / a blur of wings, / a sequined throat." 2010 Caldecott Honor Book. 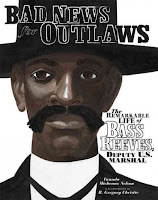 Bad News for Outlaws: The Remarkable Life of Bass Reeves, Deputy U. S. Marshal, by Vaunda Micheaux Nelson - I can't wait to read this story, and I know the students at our school will eat it up. From the Booklist review: "Young readers first see outlaw Jim Webb bursting through a glass window; then lawman Bass Reeves' eye sighting down the barrel of his Winchester rifle. 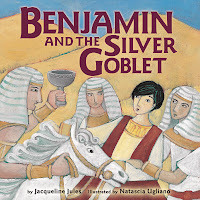 After that, kids will have no trouble loping into this picture-book biography." Winner of the 2010 Coretta Scott King Author Award. The Evolution of Calpurnia Tate, by Jacqueline Kelly - This story is for children who are fascinated by science and observations, but it does not have a lot of action. It's a wonderful story for the right kid. I did not love it, but a good friend adored reading it aloud with his daughter in 5th grade. 2010 Newbery Honor Book. Return to Sender, by Julia Alvarez - I have not read this, but am on my way to the library tomorrow to check it out! In this novel, Tyler is a sixth-grade boy on a Vermont farm who befriends Mari, the daughter of undocumented Mexican workers. Alvarez tells this tale from both sides, using the voices of Tyler and Mari. Tyler's father was hurt in a farm accident, and the family must adjust to having more help on the farm. Mari was born in Mexico and now lives in a trailer as her dad and uncle work on Tyler's family farm. I think 5th and 6th graders will like hearing this story from the point of view of two different characters who are struggling with large and small issues in their lives. Winner of the 2010 Pura Belpre Author Award. These books are available at libraries near you, and many bookstores. If you follow the links to Amazon here, a small percentage will go toward Great Kid Books. Thank you for your support! Children are fascinated by the sea. In many ways, it's the great unknown, providing huge expanses of unexplored areas. 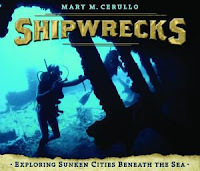 If your child is fascinated by the sea and is interested in learning more about the secrets hiding beneath the waves, look for Shipwrecks by Mary Cerullo. Oceanographer Mary Cerullo explores two strikingly different shipwrecks, looking at the path to discovering these shipwrecks, the clues to life aboard these ships and the ocean life that now makes these wrecks their home. The Henrietta Marie, a slave trader from 1700, was discovered in shallow waters off the coast of Florida by searchers working with renowned treasure hunter Mel Fisher, using a magnetometer to detect iron objects in the seafloor. Scientists and shipwreck hunters searched long and hard for the wreck of the Portland, a luxury steamship that sunk off the coast of Massachusetts in a fierce winter storm in 1898. This wreck is buried in over 300 feet of cold ocean water, and so can only be explored by a unmanned robot vehicle. Students will find the stories of these two ships very interesting. I especially liked how you got a sense of the stories unfolding. Divers were not sure at first what sort of ship they had discovered off the coast of Florida, and you slowly learn how they pieced this puzzle together. On the other hand, historians definitely knew that the Portland had sunk somewhere off the Massachusetts coast, but were not sure where exactly to look. Scientists who could estimate the exact influence of the tides and storm waves helped pinpoint an area to investigate. The text is engaging and clearly written, supported by interesting side bars. Historical documents, full-color photographs and maps illustrate the story nicely. At the end, you will find resources for further investigation and suggestions what students can do to help protect marine sanctuaries. This is an inspiring read for aspiring scientists and oceanographers! The review copy came from a local reviewing group, the Association of Children's Librarians. Find a copy at your local public library using WorldCat. If you make a purchase from Amazon using the links below, a small percentage goes to Great Kid Books. This will be used to buy more books to review. Thank you for your support! Hooray for the Cybils! I just discovered a wonderful book of poems that I had not seen before, from the Cybils 2009 Finalists for Poetry! African Acrostics is a wonderfully creative book that families, children and teachers will all love. 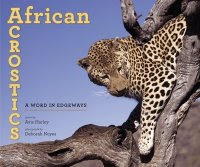 Children will be drawn in by the engaging photographs of African animals, but the poetry truly hooks listeners as they enjoy its rhythm and rhyme and try to puzzle out what hidden words are included in each poem. 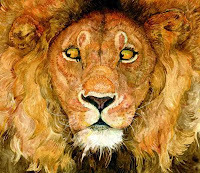 Each of these 18 inventive acrostic poems features a different African animals. Acrostic poems spell out a word using the initial letters of each line, but Harley's poems go far beyond this simple form. While some poems spell out the animal's name, others spell out more subtle descriptions. The rhino's poem spells out "beauty in the beast," while the giraffe's calls them "cloud friends." Some poems also spell out a different word using the last letter of each line (a double acrostic); there is even a quintuple acrostic with five hidden words arranged vertically. Each poem is accompanied by a full-page color photograph that shows the featured animal, often echoing the poem's mood. Deborah Noyes, the photographer, is a former zookeeper. She also wrote and illustrated One Kingdom: Our Lives with Animals. At the end of the book, Harley provides more information about different types of acrostics that you'll want to see if you can try yourself! The following page has short paragraphs of information about each animal. This book brings a new appreciation for poems that use words "in edgeways." Avis Harley has written several books of poetry. I'm especially interested in The Monarch's Progress. For an insightful, fun interview with Avis Harley, see The Miss Rumphius Effect. For other fantastic poetry finds, go to today's The Miss Rumphius Effect for all the listings. Tricia has informed me that January is National Puzzle Month - so this book of acrostic poems fits in perfectly! The review copy came from my local public library. Find a copy at your local library using WorldCat. Or purchase a copy at your local bookstore or on Amazon. If you make a purchase on Amazon through these links, a small percentage will go to Great Kid Books. Thank you for your support. I want people to be reading about children of other places and other races and religions. I think novels are a wonderful way to do that because you get in somebody else’s psyche and you see things quite differently than the way you see things simply through your own eyes. Paterson has won just about every award imaginable for children's literature, including two National Book Awards and two Newbery Awards. She is the recipient of what is commonly known as the "Nobel Prize for children's literature," the Hans Christian Anderson Award, given to an author whose complete works have made a lasting contribution to children's literature. The Bridge to Terabithia, for which Paterson won the Newbery Award in 1978, is one of my favorite books. It celebrates friendship and imagination, but also presents a child going through tremendous grief at the death of his best friend. I found with my own children, the books we read together became sort of a vocabulary for us and a way of talking about things that were hard to talk about. Sometimes all you have to do is invoke the name of the character, and the other person knows how you feel. I’d love to feel that my books were used that way or read that way. The National Ambassador for Young People's Literature is named by the Librarian of Congress for a two-year term, based on recommendations from a selection committee representing many segments of the book community. The selection criteria include the candidate's contribution to young people's literature and ability to relate to children. The position was created to raise national awareness of the importance of young people's literature as it relates to lifelong literacy, education, and the development and betterment of the lives of young people. A huge thank you to Ambassador Paterson for the beautiful gifts she has given us through her stories and through her time and wisdom. We look forward to a wonderful two years of your hope, grace, wit and charm encouraging us to bring reading into our families' and our children's lives. For the past two years, Jon Scieszka has been rocking the United States as the National Ambassador for Young People’s Literature, appointed by the Library of Congress. On January 5, 2010, a new Ambassador will be appointed. On this last day of Scieszka's term, bloggers from the around the universe are gathering to hold a party in his honor. So I say, "Have a Fresca! Let's toast Jon Scieszka!" You see, I can always remember how to say his name, because it rhymes with Fresca. Jon Scieszka has unstoppable energy, knows how to get kids to laugh, and is right on about how to inspire kids, parents and teachers. In the past two years, he's been to 33 states, and 274 schools, libraries, bookstores, conferences, and festivals. He brought kids laughter, connected kids to great books, and made them feel like authors themselves - that they had stories to tell, and people wanted to listen. And through this all, he's continued to write fantastic books! * Let each child choose what she or he wants to read. I'll never forget my own son's reaction reading Little House on the Prairie (a favorite of many readers): "Are they really going to spend this whole chapter making a door?" * Expand the definition of "reading" to include non-fiction, humor, graphic novels, magazines, action adventure, and, yes, even websites. It's the pleasure of reading that counts; the focus will naturally broaden. A boy won't read shark books forever. * If a kid doesn't like one book, don't worry about finishing it. Start another. The key is helping children find what they like. * Be a good reading role model. Show kids what you like to read, what you don't like to read, how you choose what you read. Let them see you reading. * Avoid demonizing television, computer games, and new technologies. Electronic media may compete for kids' attention, but we're not going to get kids reading by badmouthing other entertainment. Admit that TV and games can do things books can't. Talk about how reading can make a world in ways that movies and games can't. In order to help boys find great books to read that connect with their interests, Scieszka founded GUYS READ. It's a great resource for parents looking for books that their boys might be interested in. I love the category headings, ranging from "How to Build Stuff" to "At Least One Explosion". The best thing about Scieszka's work throughout is his sense of humor. Whether it's in the little preschool trucks that just bubble over with enthusiasm about crashing into anything and everything in Smash! Crash!, or it's the brothers crossing swords as they pee together in the toilet in his autobiography Knucklehead. He knows how to make boys laugh, parents laugh, and teacher laugh. So thank you, Mr. Ambassador, for all you've done for us over these past two year, but especially for making us laugh. The Cybils 2009 finalists have been announced, and it's a great collection of books. Cybils strives to recognize books of the highest literary merit and greatest "kid appeal." Books may be nominated by anyone, and are judged by two different panels of bloggers. This year, I am particularly pleased that Cybils broadened their category for Early Readers to also include a subset of for Short Chapter Books. If you are looking for books for your kindergartner, 1st, 2nd or 3rd grader, come check out these books! I am thrilled to be participating in Cybils this year as a 2nd round judge for this category - it's an honor. The 2nd round panel will discuss these books. Winners will be announced Februrary 14, 2010, Valentine's Day. Note: the links above will take you to Amazon. If you make a purchase through Amazon, you will be supporting the Cybils organization in its work to manage these awards.